SUNY New Paltz in Ulster County, New York is a public liberal arts college, but on this flamboyant campus, visual arts reign supreme. 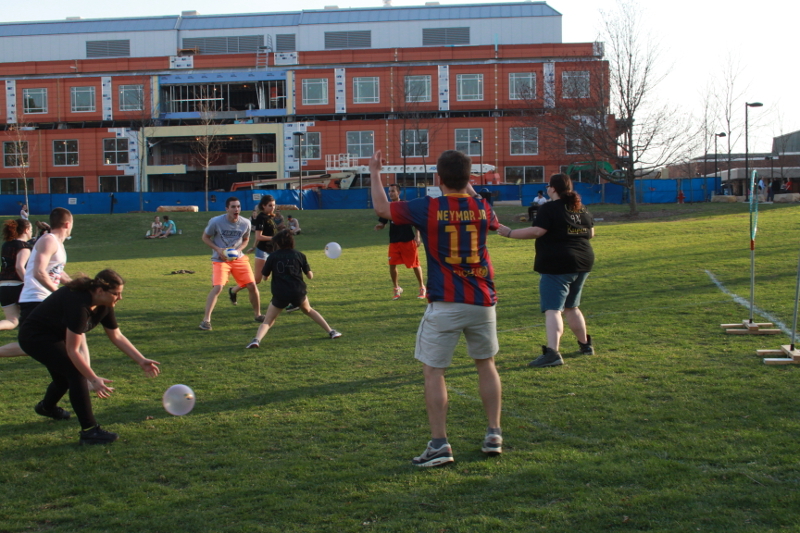 Students aren’t afraid to experiment with radical, controversial ideas or stop members of the campus community in their tracks. Take Connor Henderson, a fourth-year art education and photography double major, whose class project for his fall 2016 Photobooks and Illustration course quite literally popped up one morning in the academic quad. A multi-platform artist who approaches his work from a “critical feminist lens,” Henderson toyed with the idea of privacy and surveillance in our society. He snapped hundreds of photos of campus community members walking across the quad, unbeknownst to his subjects. 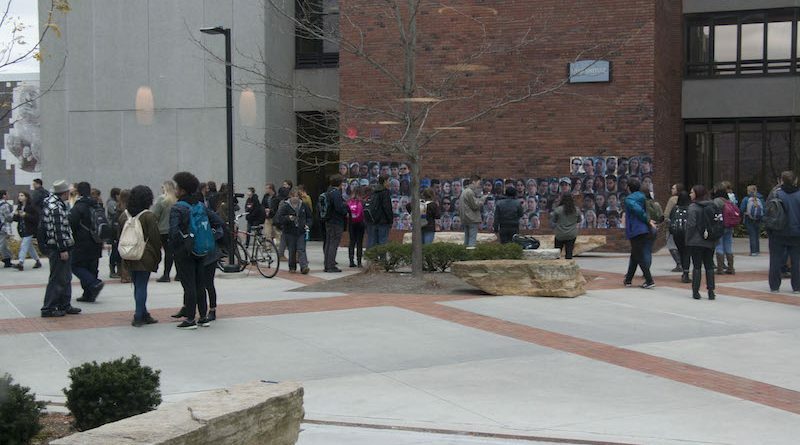 A week later, Henderson printed about 50 of the photos he’d taken and assembled them into a pop-up art installation on the facade of the Humanities classroom building around 9:30 a.m. 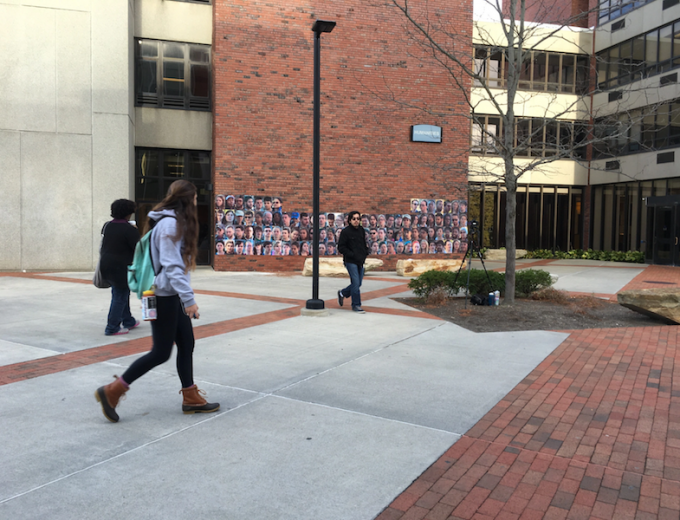 Featured among the photos were portraits of faculty, students, and even casual passersby walking through campus. The portraits were blown-up into small, tile-like squares, spotlighting the expressive — and, occasionally, painfully awkward — visages of his unwitting subjects. 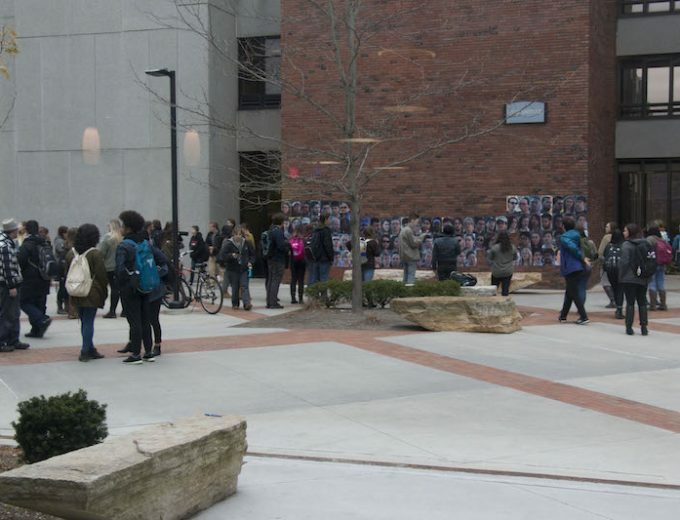 Henderson didn’t try to be particularly discreet during the photographing or installation process, nor did he ask any facilities managers or campus administrators for permission to install his piece. “I was just standing in the middle of the walkway taking pictures, and not one person asked me what I was doing,” he says. What Henderson didn’t anticipate was the visceral reaction the campus community had to his artwork. The artist received multiple reports of people “tearing down the photos,” he says, and since he didn’t ask anyone for permission to display his work publicly, janitors eventually tore down the remainder of the installation. He received angry emails and Facebook messages galore, but Henderson wasn’t fazed. On the other end of the spectrum is Jacqueline “Jacqui” McCullough, a recent New Paltz graduate who earned her bachelor’s of fine arts in graphic design. 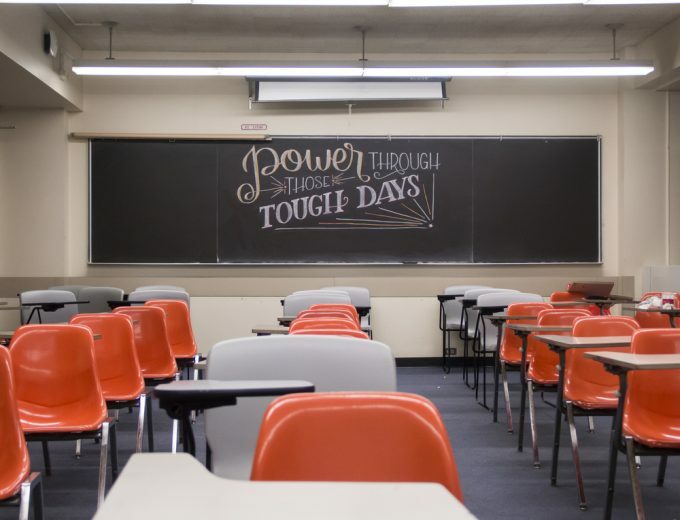 For her senior thesis project during the spring 2015 semester, McCullough hand-lettered a series of chalkboard displays and postcards with motivational, positive quotes. McCullough’s displays were featured prominently in classrooms across campus, and she hung 50 or so postcards on the walls of the tunnels between Lecture Center and Sojourner Truth Library. Her intricate, ornamented lettering, complete with delicate filigree and complementary color schemes, was difficult to miss. It was a laborious process, McCullough says: the postcard installation alone took up to 15 hours to complete. Each of McCullough’s chalkboard displays took between 4–10 hours, including her planning and sketching process. When her thesis project was finalized, though, the artist delighted in seeing the campus community’s reaction to her work. 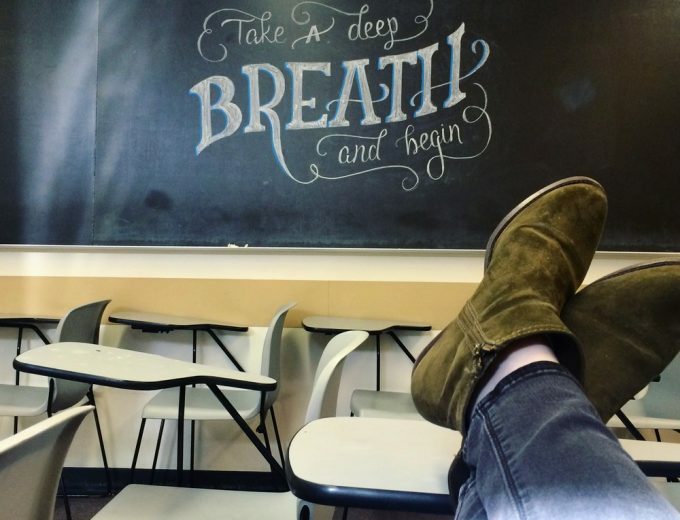 “I would go into classrooms in the evening [to make the chalkboard displays,] and then I’d see people’s reactions to them the following week on Instagram or Snapchat,” she says. She called her project Public Positivity, a moniker that played off of her desire to give back to the community she called home, she says. Public Positivity for TLR from Sam Manzella on Vimeo. Despite their radically different projects, Henderson’s and McCullough’s works have one key thing in common: their backdrop, a public space not designed for or typically associated with art. It’s the underlying thread that links these projects, and it’s a key piece of insight into why art installations in public spaces often elicit such intense and evocative reactions from spectators. Dr. Rachel Somerstein, a visual culture scholar and assistant professor of journalism and digital media at SUNY New Paltz, explains that art in a public space isn’t inherently different from art in a formal gallery setting. Instead, it’s the audience’s reaction that differs, she says. 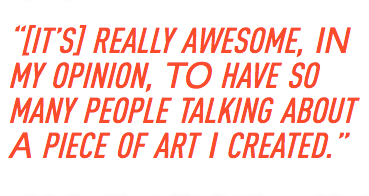 What does Somerstein think of pop-up art installations, like McCullough’s and Henderson’s work? It’s a great way to try out ideas, she explains: artists often feel a lot of pressure if they’re putting together a show or exhibition for a formal setting. For some people, that pressure can be motivating…but for others, it can be incredibly stifling. 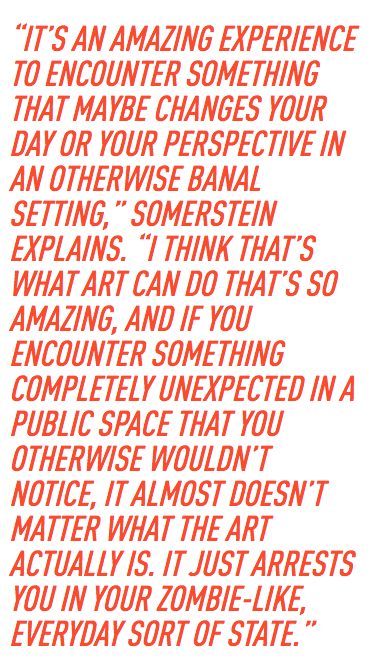 That’s why Somerstein believes that colleges and universities are prime settings for pop-up art installations. Art students learning to hone their craft can experiment with new ideas, especially ones that are too controversial or incendiary for a more rigid, formal setting. 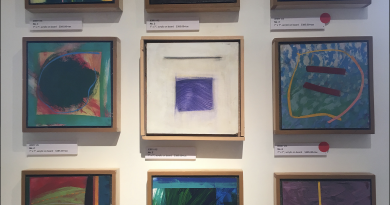 According to Somerstein, art in a public space is less elevated than art in a formal setting…and that’s precisely why some artists chose to display their work in an informal, public area. An artist might not want their audience to feel intimidated by their work, as viewers might feel in a setting like a gallery or museum, where social etiquette is highly emphasized, Somerstein says. Formal artistic settings, where artworks are usually commodified by default, attract a very specific type of audience, and an artist might want to broaden their range of exposure to a more general viewership. 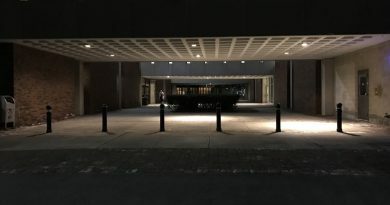 Public art doesn’t require that viewers pay or go out of their way to gain access to a museum or gallery, Somerstein says, which can be a barrier for many people in and of itself. Many communities across the country, especially in major urban areas, are fighting to preserve and expand upon public art installations. A June 2016 article from St. John’s Law Review details how public art installations in cities like New York City, San Francisco, or Chicago are “[destroyed] more often than one might assume.” Henderson’s project instantly comes to mind, and similarly thought-provoking, controversial works are often the victim of desecration by angry community members or community officials looking to stifle controversy. But public art can serve as a tool to beautify and decorate public spaces, enhancing the quality of life for the people who inhabit those spaces, the article’s authors argue. Perhaps most importantly, public art builds community. Whether through a shared misunderstanding or a shared appreciation, public art can bring people together, unifying community members across barriers of gender, race, class, or ethnicity. Somerstein also believes that art installations in cities can spur and spread positive social change. Samantha is a professionally-trained journalist and copywriter who lives and works out of New York’s beautiful and vibrant Hudson Valley. A lifelong lover of learning with a background in feminist scholarship, Samantha approaches her assignments from a critical feminist standpoint. She believes in supporting and promoting local businesses and business owners; spotlighting the work of small, regional artists and creatives; and practicing ethical and sustainable consumption habits for a greener planet. The SEO Course in Uttam Nagar is one in all the few endorsements within the world of business trade. this chance is availed by professionals whose capability of rigorous, process-oriented exams through rigorous study or direct talent. there’s associate getting the proven fact that it helps participants in changing into qualified professionals. Want to join the best Digital Marketing course in Delhi NCR? So in Dwarka, we are providing that at an affordable price in with 100% job placement. For more information just clink the mentioned link.